Roughly 3.3 million dogs enter shelters throughout the United States each year, according to the ASPCA, either as stray dogs or surrenders. That means, each year, more than 3 million dogs are looking for what we crazy dog people often refer to as their “furever” homes. As someone with two rescues myself, I am very passionate about rescuing these loving animals and giving them good homes. Unfortunately, many well-intentioned people only focus on the rescuing aspect and fail to consider the second half: providing a good home with a quality life. While a good deal of that quality comes from how well you love and treat them, your finances do play an important role in giving a dog a high quality of life. As it stands today, more than 1 million dogs are surrendered (given up by guardians willingly) annually, according to more stats from the ASPCA. While reasons vary, (and likely include moving and not being able to handle a dog’s behavior) the real cost of dog care is a prime factor. If you are considering opening your home to a dog, take some time to do the math to make sure you’re just as ready to open your wallet. Here are some hidden costs of dog guardianship, beyond the adoption fee, that you might not have considered. For both my dogs, Greyson (a greyhound/Weimaraner mix) and Clyde (a Great Dane), this is the largest expense I incur. Here are just some of the many medical expenses to consider. Your dog needs a physical examination every year. Because dogs’ lives pass much faster, so much more can happen to their bodies in a year. This is a good opportunity for your vet to spot issues before they become life-threatening. Your dog’s yearly checkup is also when he’ll get the vaccinations for diseases such as rabies, bordetella and distemper. The American Medical Veterinary Foundation, or AVMF, has a comprehensive list of vaccines your vet may mention. These visits are not without their price. Each yearly checkup typically costs me around $50, plus the cost of vaccines, which can vary. Real talk for a minute: dog mouths get pretty gross. While you can (and should) regularly brush your dog’s teeth and gums, it is unlikely that you will be able to keep his teeth free from disease. Poor dental hygiene can result in bad breath and tooth decay, as well as diseases of the liver, kidney and heart, reports VetStreet.com. I have had Greyson, who is now 8, for about five years. In that time, he has needed two dental cleanings and multiple tooth extractions at each one. The combined costs of both surgeries was nearly $1,000. Greyson’s teeth in particular are prone to disease because he doesn’t chew his food (he inhales it) and because he has no interest in chew toys. Without regular chewing behaviors, he does not naturally clean his own teeth. While not every dog will need similar care, it is always a gamble when you adopt a dog because you have no idea what issues may arise. As equally unpredictable as dental maintenance, illnesses and injuries are very common in the 10+ years you can expect to have your dog, especially as they reach senior years. Greyson has fractured a leg leaping off a couch and has to have regular blood work done for his hypothyroidism. He was also on anti-anxiety medications for a long time for separation anxiety. Clyde, on the other hand, likes to munch on other dogs’ “presents” before I can stop him and has thus gotten his fair share of worms. I remember laughing when a friend told me that his dog had seasonal allergies and was on medication. Years later, I now give Greyson Claritin. Dogs, like people, sometimes require medications to stay in proper health. Beyond those common meds, however, I’ve had to regularly administer thyroid pills, anti-anxieties, pain killers, arthritis medications, steroids, ear cleaners and more to my dogs. The most important note: they all cost a significant amount of money. Since Greyson has been especially prone to accident and illness, I finally broke down and got him pet insurance. His plan is moderate in terms of what it offers and has its pros and cons; I spend $35 a month on it through ASPCA. Have I gotten my money’s worth? I can’t say for sure, but it’s nice knowing that all the costs listed above, especially those surprise illnesses and injuries, are at least somewhat manageable with insurance assistance. Therefore, if you have a middle-aged dog or older — or a dog prone to sickness — I highly recommend looking into pet insurance. Food is another high cost for both of my dogs. Before rescuing a dog, do some research on the breed to anticipate common food allergies and to determine how large the dog will get. Both of my dogs are on a premium food for health and allergy reasons, and, given their size, they eat a lot of it! I currently spend about $150 a month on dog food. That’s on the high end, of course, as Greyson and Clyde are 90 and 150 lbs respectively and eat a salmon-and-sweet potato diet. Adjust the number for size and the food brand you intend to feed, though I do recommend finding a quality food to ensure proper health. DogFoodAdvisor.com is my favorite website for this. A trained and obedient dog is a happy dog. You’ll either need to spend quality time regularly training your puppy or dog or need to enroll your dog in training classes. Prices and types of training (group, private lessons, etc.) will vary, but PetSmart’s training prices are a good indicator of what you can expect to spend. Do you own a home or rent? If you own your house, is your house suited to a dog, or will you have to make some adjustments? The costs of building a fence for the backyard or adding a doggy door can add up; while they are not necessary, fenced-in yards and other small tweaks to your home can improve your dog’s quality of life. If you rent, you’ll have more financial hoops to jump through. Most rentals require a pet deposit, many of which are non-refundable. I’ve moved a lot with Greyson and have seen deposits range from $200 to $1,000. On top of that, most rentals require a monthly pet rent, often based on weight. I’ve paid $25, $35 and $50 a month for Greyson in the past. One cost you never want to consider is damage to your home or property due to a misbehaving dog. Carpets get soiled, furniture and belongings get eaten and, in extreme case, doors and walls get knocked down. Proper training should prevent these issues, but, as they say, accidents happen. For most vacations, you’ll have to leave the dog behind. While some people are lucky to have friends and family who will volunteer to watch the dog for free, there are times when you may have to pay to board the dogs. Boarding fees can vary depending on where you go and the amenities you choose. I’ve paid more than $100 a night for Clyde before, which quickly adds up during already expensive vacations. Beyond boarding, think of your workday. Will your dog be alone for long hours every day? If so, you’ll need to consider a doggy day care or a dog sitter/dog walker to make sure your dog isn’t left alone too long. Dogs are smarter than we give them credit for. They require lots of engagement, so you’ll need to keep your dog supplied with plenty of options: rope toys, stuffed toys, Kongs, antlers or other safe bones, frisbees, balls and more. While some toys are durable, dogs may easily (and quickly) destroy others and expect something new to play with regularly. Greyson isn’t too interested in toys, but Clyde, who again is 150 lbs, goes through toys quickly. It’s not just toys you’ll need, however. Dogs need a leash and collar, food bowls and brushes, beds and crates, as well as the most ridiculous things you’d never consider. Greyson’s arthritis meant that I somehow decided to buy him a $65 Tempur-Pedic dog bed. It may sound crazy, but trust me, you’ll make similarly “crazy” purchases once a dog steals your heart. Other costs to consider are things like yearly registration, a new name tag every time you change addresses and grooming fees if your dog’s coat requires regular maintenance. The final cost to consider is that of your own time. I have missed so many days of work caring for Greyson and Clyde in times of emergency . I have also missed out on a lot of fun activities because I couldn’t leave the dogs behind too long; while it is certainly not a cost factor, it is something important to consider. But the best part is, it is absolutely worth it. There is no love like a dog’s, and I do not regret a single dollar or minute spent to give Greyson and Clyde a better quality of life. Dog guardianship is incredibly expensive (I know that I have spent more than $10,000 over the course of Greyson’s life), but I wouldn’t trade it for the world. If you are financially confident in your ability to adopt and give a loving home to a dog in need, I encourage you to go for it. And if you are finding the expenses may be a tad out of reach right now, I encourage you to start saving and rethinking your budget; eventually, that money saving will turn into saving a dog’s life — and it’s worth every penny. 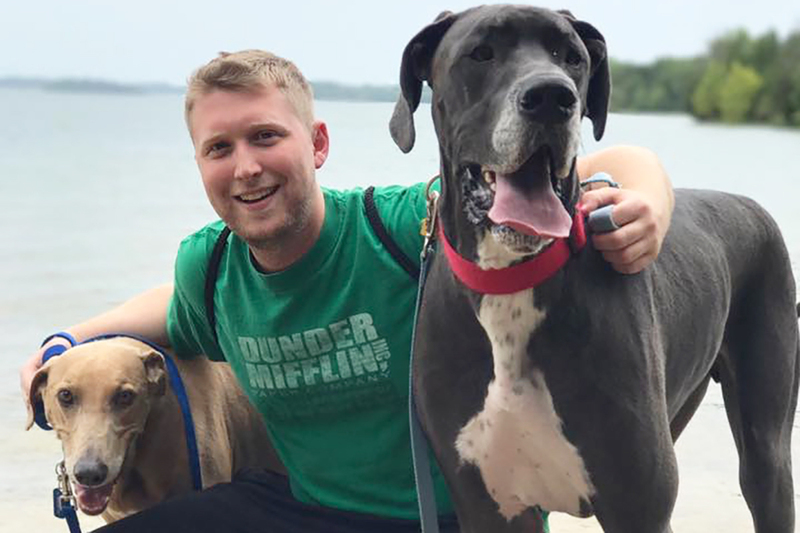 If asked what his number one job is, Timothy Moore would likely say, “Doggy daddy.” But when he’s not caring for his dogs or taking them for hikes with his partner, Tim is usually writing, reading, editing or enjoying a good beer with friends.